Guru Gobind Singh Indraprastha University in short known as (GGSIPU) is one among the top repute educational institution in India. The institute conducts an entrance exam for the aspirants willing to seek admission for the various courses in the name IPU CET. IPU CET abbreviated as Indraprastha University Common Entrance Test is a national level entrance exam conducted to seek admission in various undergraduate and postgraduate degree programs. The exam is the key to seek admission is 81 affiliated private colleges in India. IPU CET is conducted once in a year usually in the month of April. The exam has certain eligibility criteria which have to be fulfilled by the candidates to appear for the entrance exam. Guru Gobind Singh Indraprastha Univeristy announces the schedule for IPU CET 2019 through its official website. The details about opening of application form till counseling schedules are mentioned in the below table. Guru Gobind Singh Indraprastha University has set certain eligibility criteria for IPU CET 2019. However the eligibility for every course differs from one another. Below mentioned are some of the eligibility criteria to appear for IPU CET 2019. Age: Candidates appearing IPU CET 2019 for undergraduate courses like B.Tech/BCA/BBA/LLB at Indraprastha University should be 17 years (minimum) and maximum 21 years. Whereas candidates appearing for IPU CET for Postgraduate courses like M.Tech/MBA/MCA should not be more than 35 years of age. Nationality: IPU CET 2019 accepts candidates with nationality status as Indian/Overseas Indian/Nepali. Candidates should have passed 12th from a recognized board with minimum 55% aggregate in PCM subjects. Aggregate not less than 50% in any bachelor’s degree program. Minimum 50% aggregate in any bachelor's degree program with mandatory subjects like Mathematics and English. IPU CET 2019 application form will be released by Guru Gobind Singh Indraprastha University official website in the month of February 2019. Candidates while filling the application form will have to provide all the required details accurately and choose the CET code correctly as if differs for various course. Visit IPU CET 2019 official website and navigate to Exam Category. Fill the application from with required details and click on submit. Once the generation of Login Id and Password is done make the payment. Download and print the application form for further use. Registration: Candidates should register for IPU CET 2019 by providing details such as name of the candidate, date of birth, contact number, email Id, region, etc. Application Fee: Fee for IPU CET 2019 is INR 1000/- and the payment can be made through online mode i.e., net banking/debit card/credit card. Uploading documents: Candidates should upload the scanned copy of recent passport size photograph of the candidates and signature of the candidate. ID and Password: After the submission of application form candidates Id and Password will be generated, that will be mailed to the registered email Id. IPU CET 2019 is conducted by Guru Gobind Singh Indraprastha University through pen and paper mode in their established exam centers. The exam pattern will be multiple choice questions and the duration will be 3 hours. Complete details regarding the exam pattern are mentioned below. Mode: IPU CET 2019 will be conducted though offline mode, i.e., pen paper based test. Candidates should carry a black ball point pen to the examination hall. Medium: IPU CET 2019 exam will be conducted only in English. Duration: IPU CET 2019 examination will be held for 150 minutes i.e., 2 hours 30 minutes for B.Tech candidates. For B.Tech in Bio-Technology the duration of the examination will be 180 minutes i.e., 3 hours. Subjects: IPU CET 2019 exam papers will consist of 3 subjects i.e., Physics, Chemistry and Mathematics/Biology subjects. Paper Pattern: IPU CET 2019 exam paper consists of multiple choice questions. Each question will be provided with 4 options and the candidates will have to choose the right answer. Number of questions: IPU CET 2019 will consist of total 150 questions for B.Tech and fro B.Tech in Bio.Technology questions paper will be set for 200 marks. Marking Scheme: Every correct answer at IPU CET 2019 with fetch 4 marks and every wrong answer is deducted 1mark. Total Marks: IPU CET 2019 question paper will; be set for 600 marks for B.Tech and for B.Tech in Bio-Technology paper will be set for 800 marks. Logon to IPU CET official website and navigate to admit card download link. Login using the application number and password. Once the admit card its displayed download and print for further use. 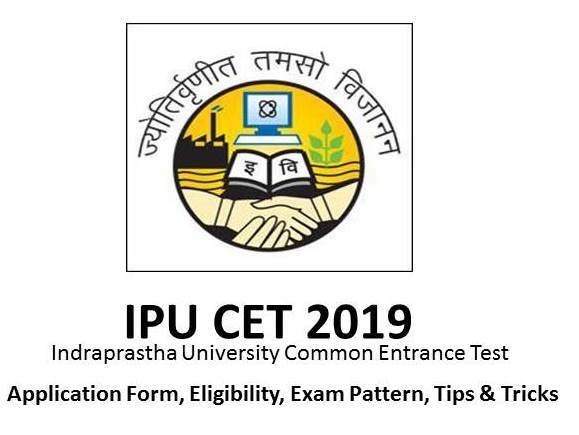 IPU CET 2019 admit card contains of all the mandatory details like application number, photograph, venue, time, etc. In case any candidates fails to carry their admit card to the exam center, candidates will not allowed to attend IPU CET 2019. Candidate should verify the detail mentioned on the admit card, if any details are incorrect candidates should immediately bring it to the notice of concerned authorities. Candidates are supposed to keep the copy of IPU CET 2019 admit card till the admission process. Guru Gobind Singh Indraprastha University declares the results of IPU CET 2019 through online mode. The result will be announced in the month of May 2019 and the rank list can be downloaded from the official website by logging in. Log on to IPU CET official website and navigate to results link. Click on the PDF link, check for your result and download the list. Candidates can take the print out of the PDF for further use. IPU CET 2019 begins soon after the announcement of result declared by Guru Gobind Singh Indraprastha University. Admissions for the candidates are based on the rank obtained by the in IPU CET 2019. The counseling will be conducted in multiple rounds and seat allotments will be done on the basis of merit list. Registration: Candidates has to register them for counseling process through the official website of IPU CET 2019. Counseling Fee: Candidate should make the payment of INR 1000/- (extra charges as applicable) to confirm the registration for counseling. Choice Filling: Candidates has to fill their preferred choice for online seat allocation. Seat Allotment: After every round of Counseling, if the candidate is satisfied with the seat allotted to him/her can be freezed. Withdrawal and Fee Refund: Candidate willing to withdraw the admission against the allotted seat, they can apply for withdrawal by clicking on the withdrawal option. IPU CET 2019 is a national level entrance test conducted by Guru Gobind Singh Indraprastha University. The university has established its exam centers in vario9us city of Indian state to make it available for the students to appear for IPU CET 2019.